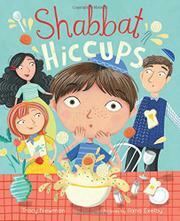 Jonah’s incessant hiccupping during the weekly Shabbat observance prompts members of his family to suggest a solution. Through the early-evening preparations, the candle lighting, blessings, and dinner, Jonah unsuccessfully tries to ignore or control his hiccups. Cousin Eden attempts to scare them away, and Grandma Sue suggests eating some sugar. Grandma Sue then offers a better remedy: to drink a glass of water all in one gulp. This does the trick—until the next evening, after the concluding Havdalah ceremony, when not only does Jonah have a hiccupping setback, but Grandma Sue also seems to need to follow her own advice. The story’s arc nicely folds in all the elements and practice of the weekly Shabbat celebration while maintaining a slightly understated air of amusing angst. In addition, the inclusion of the traditional Havdalah at sundown to bring the daylong observance to an end is effortlessly described, creating a complete picture for the weekly ritual. Animated faces in gouache and crayon depict a youthful family, including a contemporary grandmother with highlighted auburn hair. Jonah and his dad have pale skin and light-brown hair, while his mom and little sister have olive skin and black hair.